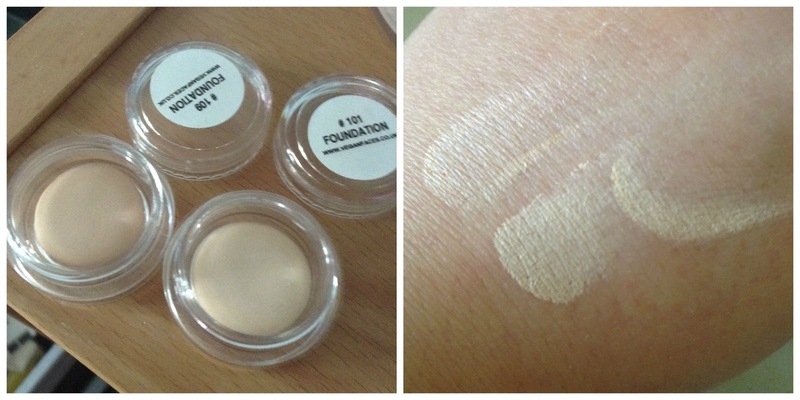 I selected shades 101 (fair skin with peaches & cream undertones) and 109 (light-medium skin with pink undertones). Both shades are too pale for me, 109 is the darker of the two. I like the idea of this foundation but found it difficult to work with. It is creamy but there is an element of chalkiness. Once applied to the skin I find it takes a fair amount of effort to work across the face. It does not feel heavy but there is something about it that makes me think of face paint rather than foundation. I used a sponge to blend out but the end results are not as good for my skin as Everyday Minerals powder. I feel as if this emphasizes every line. I like the the ethics of this company and I do not wish to put you off so if you are a lover of all things makeup, check out Hephzibah’s blog Good For Me, Good For You, for reviews and swatches of Vegan Faces lipsticks and eyeshadows (blues, pinks and nudes). If you have tried Vegan Faces foundation, I would be interested to know if you liked it. I think that this product would work really well for those who need more coverage (ex. those with acne). I find that the best method to cover up acne is to take the foundation, apply it evenly all over your face, and then dab on more product where extra coverage is needed. If this company had a liquid foundation, I would buy that, and use this cream concealer for extra coverage when needed! Shame this didn't work for you - do you think it would work well as an eyeshadow primer? Still on the lookout for a natural one as my eyelids get really oily but as you said this is almost chalky do you think that'd work?